After five decades Melodrama Theatre proves to be Absolutely Arizona. TUCSON, Ariz. -- The road to success for the Gaslight Theatre was as rough as a stagecoach ride at times. Fitting for a melodrama theatre that often puts on shows about the Wild West. You can trace the beginnings of the Gaslight Theatre back to 1977. Tony Terry, a 24-year-old University of Arizona student, grabbed some friends from the drama department and began a melodrama theatre in Skagway, Alaska. "And I lost my shirt," recalled Gaslight Theatre Owner Terry Tony. "Oh my gosh it was difficult." Undeterred, Tony came back to Tucson after two summers of entertaining cruise ship passengers in Alaska. He and his cast began performances in Trail Dust Town. "We used to go to Pinnacle Peaks and giveaway tickets when we didn't have enough people. We had more people on stage then I had in the audience. It was just brutal, brutal." But perseverance, and kind reviews in the newspapers, led to eventual success for the Gaslight Theatre. "It was so, so much fun," Terry reminisces. "Still today, 41 years later, I've never worked a day in my life." The Gaslight Theatre moved from Trail Dust Town to it's own theatre at Tanque Verde and Sabino Canyon. Then in 1990, Tony and his business partner Tom Benson, bought the old Jerry Lewis Theatre. They redesigned the building and added a balcony for more seating. 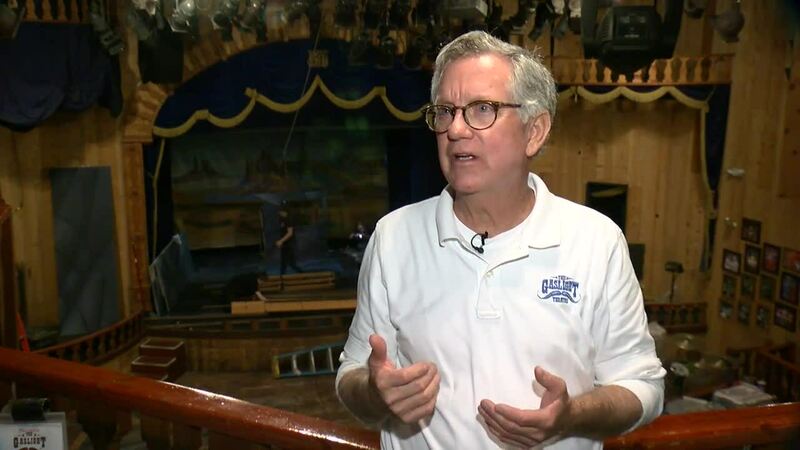 The Gaslight has been making Tucsonans laugh now going on 29-years at the same location., with many of the same talented and dedicated people behind the scenes and on stage. "The amount of talent that we have is incredible. Really incredible." Tony has a very good idea about how to run a successful theatre, and a successful life. "You've got to find your passion in life," he said. "It can't be about money, it's got to be about your passion. That's it, I don't ever come into work how much money can I make? I come into work thinking how can I be the best theatre." The Gaslight Theatre just opened a new show called " The Belle of Tombstone ." It runs through the end of March. Tony also runs Little Anthony's Diner , Grandma Tony's Pizza, a costume shop and a print shop. They are all located at the same Broadway and Kolb location, all to support the Gaslight Theatre. Little Anthony's recently added an Elvis and Marilyn show every Friday and Saturday evening, to entertain diners.